The Commonwealth of Kentucky, through the Kentucky Finance and Administration Cabinet, awarded Aquarius Marine, LLC, a wholly owned subsidiary of C.J. 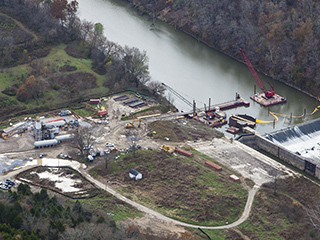 Mahan Construction Company, LLC, the project for the renovation of Kentucky River Lock and Dam #8 on the Kentucky River, south of Lexington, Kentucky. The pool provided by Lock and Dam #8 supplies Lexington with its source of drinking water. The existing lock was originally constructed in the early 1900’s and has been modified several times during its lifetime. 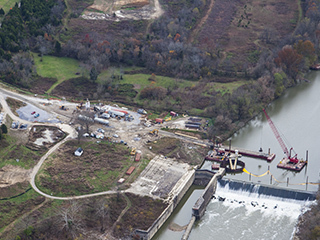 The work included underwater concrete placements in connection with the permanent closure of the lock upper miter gates and the installation of a 42” x 42” heavy duty cast iron sluice gate in the existing concrete bulkhead wall. 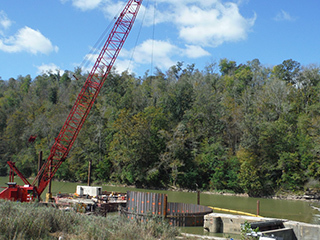 Also included were the construction of three cellular sheet pile structures and connecting arc cells running parallel to the existing Lock and Dam #8, as well as site preparation, water control with fluctuating river levels, east and west abutment feature tie ins, lock chamber modifications, foundation improvements, channel lining bank protection features, selective demolition, site restoration and seeding. © 2018 C.J. 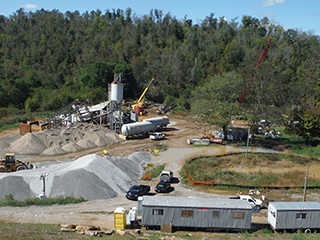 Mahan Construction Company, LLC. All rights reserved.